An enjoyable off-season rock climbing area, Vantage offers a wide variety of sport and traditional climbs with quick trail access in a well maintained setting. Vantage boasts a wide variety of climbs from 5.5s to 5.12s, with a wide selection of 5.10s and 5.11s to choose from. Located east of the Cascades, Vantage is a classic climbing spot in the off-season while the summer months can bake you on wall. While there are no camping fees, a Washington Discovery Pass is needed to park there. 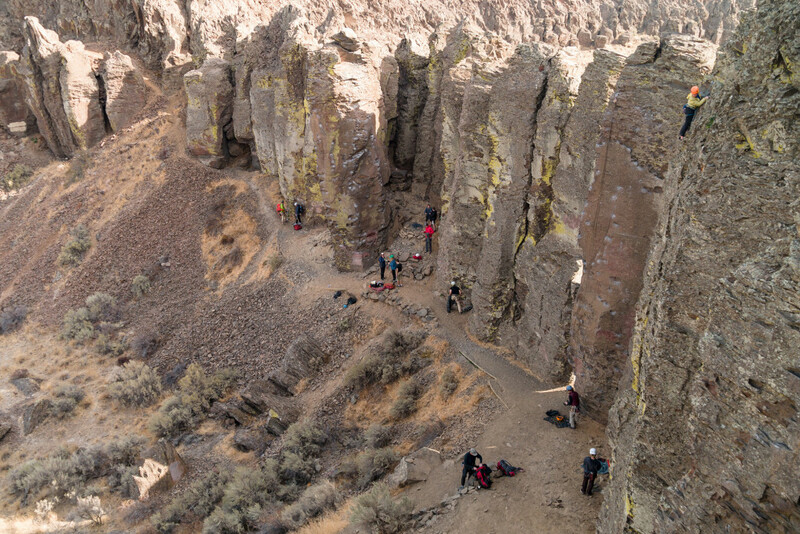 An oasis for the rain soaked climbers living west of the Cascades, Vantage is a semi-desert climbing spot boasting a collection of sport and traditional routes that entice both beginner and more expert climbers alike. Whether you are looking for enjoyable chimney and crack routes for traditional climbing or balanced face sport climbing, you'll find it within a quick hike from the main parking area. Ideally, Vantage is climbed during the fall to spring season due to the intensive summer heat that can bake the walls, but when the weather cooperates this well-maintained crag can have you savoring for more of its volcanic basalt routes. 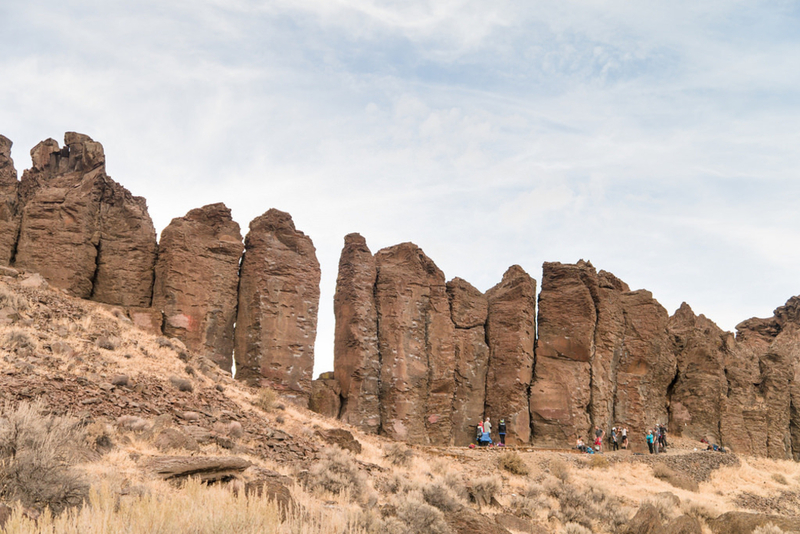 The bizarre basalt columns, labeled on the map as Frenchman Coulee and Echo Basin but known to climbers as Vantage, rise out of the semi-desert landscape and offer a unique contrast to Washington climbing. The majority of the more than 600 routes are sport due to the choosy nature of the crack climbs, but there are established classic traditional routes. Carved out by ice age floods, the Vantage cliffs are notably divided by two layers with the top layer being a columnar formation which is great for traditional crack climbing and sport climbing on the faces in between. The lower layer is a blocky entablature that mainly encompasses sport routes, some of which can be slightly overhanging. From the main parking lot the first two walls are easily seen. The Feathers are a collection of free standing column walls on the north end of the main parking lot. To the southwest is Middle East Wall which is somewhat underdeveloped compared to the rest of Vantage but still offers bolted routes, many of which are in the 5.10 to 5.11 range. Hiking from the trailhead takes you up the mesa and down into Echo Basin on the south side. Taking the trail to the right will lead you to the classic Sunshine area along with River Park and Jigsaw Wall among others. Hiking the trail to the left will bring you to the blocky entablature areas of Fat Man, Skinny Man, M&M, and Powerhouse Walls. The guide book Frenchman Coulee by Marlene Ford and Jim Yoder, if you can get your hands on it, will help navigate you around the walls. 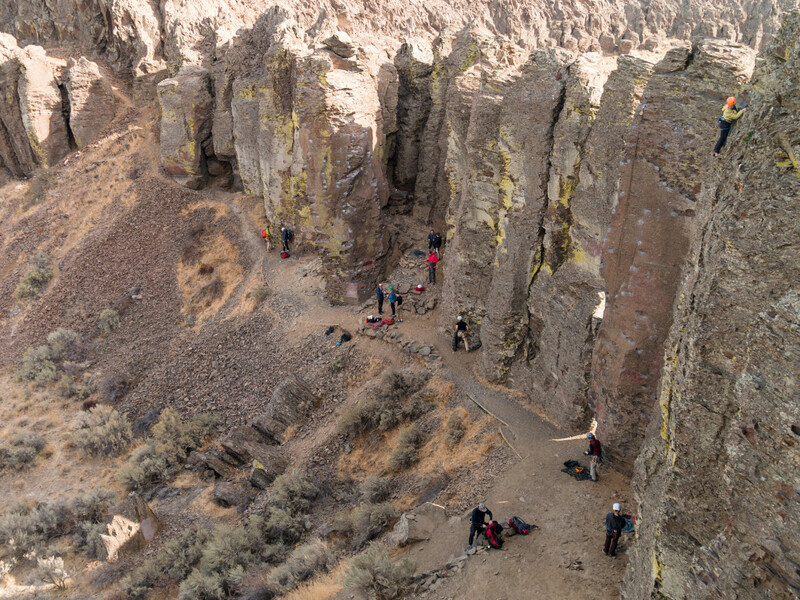 Another option is The Best of Frenchman Coulee by Marc A. Dilley that focuses on the best routes on specific walls in the area, a quick internet search will bring up the pdf version and allow you to download and store it on your phone. Climbers looking for a terrific off-season crag with a wide variety of sport and traditional routes, easy hiking access, and in an area superb for spending the weekend with friends, Vantage is an ideal setting. Whether it is lead practice at The Feathers or heartily enjoying the ample array of 5.10s and 5.11s it is simple to see why this is one of the top climbing spots in Washington. From Ellensburg, continue on I-90 over the Columbia River, past the town of Vantage, and take exit 143. Turn left onto Silica Road and drive for just under a mile to the Old Vantage Highway. Turn left and drive 1.5 miles to the main parking lot. Primitive camping is allowed here, just ensure you have a Washington Discovery pass or day pass which can be picked up at most sportsman shops. Other things to note, do not top out on the cliffs in order to avoid damaging the delicate clifftop vegetation, stay on the trails, and read the posted notices at the trailhead for closures that can occur on Middle East Wall for falcon nesting. Come with plenty of water and of course, on warmer days, there is a swimming area at the end of the Old Vantage Highway, but be careful of glass as Gorge party goers frequent this beach as well.